WHO’S LOOKING FORWARD TO DYING? I think I need to do a search. I need to find all these Christians who are looking forward to dying. According to this graphic, the earth is apparently overwhelmed with suicidal followers of Jesus Christ. OK, so maybe I’m just having a little fun. But I have to wonder why anyone in the atheist community (which is where I found this graphic) could so thoroughly believe such a notion that they would create a graphic to tell the world. 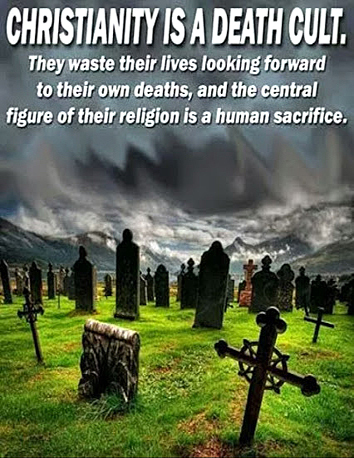 While I’m sure there are some Christians out there who want to die (perhaps a few on their death beds, for example), I’ve yet to meet even one of them. In the meantime, what about “wasting their lives”? The Christians who are still in the Nepal helping victims of the devastating 2015 earthquake are certainly doing something that most people would call productive. Same for the Christians who join Samaritan’s Purse around the world helping survivors of earthquakes, wildfires, volcanoes, tornadoes, tsunamis and cyclones. Wasting their lives looking forward to death? Really? Should I wonder about the Christians who put their lives on the line (again with Samaritan’s Purse) fighting the deadly Ebola Virus in Liberia in 2014? Was that just a death wish? Now, about the central figure of Christianity: was He a human sacrifice? In some respects, yes. Most Christians believe the Bible’s assertion that God put His love on the line for us through Jesus Christ (whom serious Christians believe is God’s son). Nothing you or I can do will make up for the wrong things we’ve done and the right things we’ve failed to do. Nothing. Indeed, all of us go wrong every day, in ways we don’t see because we live in a world that suggests “if it feels good, do it” and “it’s only wrong if you get caught”. The only difference between you and me is I’ve figured this out. I know I can’t come close to God’s standard of perfection. But because I follow Jesus Christ, I don’t have to. Jesus did the heavy lifting for me. Oh, one more thing. After doing that heavy lifting, He came back to life. Paul, a missionary who helped spread Christianity in its earliest days, wrote a letter in the Bible and that letter says “But Christ really has been raised from death”. Paul spent most of his life telling people this. And God worked through him to start churches and spread Christianity throughout the Mediterranean. So much for a death cult, eh? Does this make you rethink what you thought you knew about the Christian faith? Yes or no, post your thoughts below and let’s have a conversation. Jesus give us life, life to perfection. We are here on earth for a reason; I see it as to work that God’s Kingdom be realized in ordinary time. Keep blogging, Frank, and keep spreading the Gospel. God sees you as a valuable vessel! It is interesting that you wrote : “the difference between you and me is that I have figured this out…” This is precisely what is dangerous about thinking the way some Christians do. They believe they have “figured it out” and , therefore, they have the answer to life’s mystery. No room for growth, because they have found their ultimate answer in the modern interpretation of Jesus’s teaching (or should I say today’s church). Paul wrote letters based on his personal experience with mystical religious practices. James taught a different doctrine and so this Peter. The writers of the Gospels (supposedly the names of their titles) did not even teach “salvation ” trough faith alone. But it is still undeniable all the good deeds some of today’s Christians perform is disaster areas. And for that, I take off my hat in reverance. But not because of their blind faith, but because of their love for those who suffer, through good deeds. Thanks for your thoughts, Noel. There are lot of things I haven’t figured out. And trust me, there is lots and lots and lots of room for me to grow in my faith.